Over the Easter weekend (that feels like a seriously long time ago now) it was my friend Strawberry Fields’ birthday. A lot of our friends were out of Melbourne for the long weekend so Gerard, SF and I had a pizza and trashy TV night on Good Friday to celebrate her birthday. Now a casual birthday is one thing, but a birthday without a cake is nothing, so I decided to bake something before she came over. I’d come across this Nigella recipe a while ago and tried it once before, it worked out pretty well and I’d been itching to try it again. 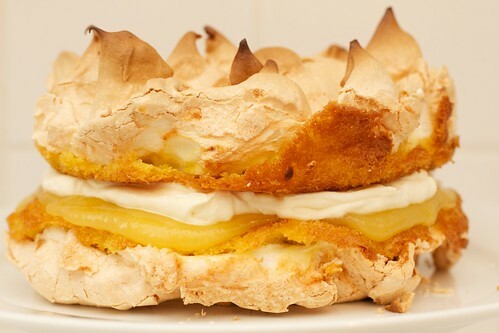 This is a cake basically made up of a layer of meringue, lemon cake, lemon curd, cream, more cake and more meringue. 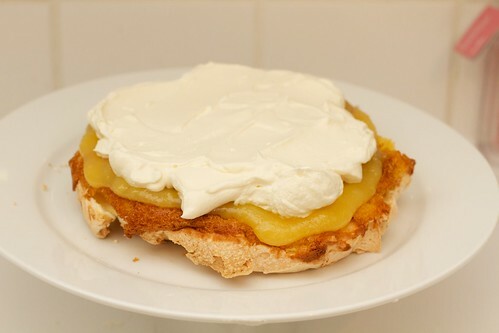 Sounds complicated but is actually really easy, especially given that you bake the cake & meringue in one piece. Trust Nigella to find a lazy way to do something. My final result didn’t look as pretty as it could have, but it certainly tasted delicious. I should mention that I have made my own lemon curd before but this time was running late so in the easy way out spirit of Nigella I just bought a jar from the supermarket. 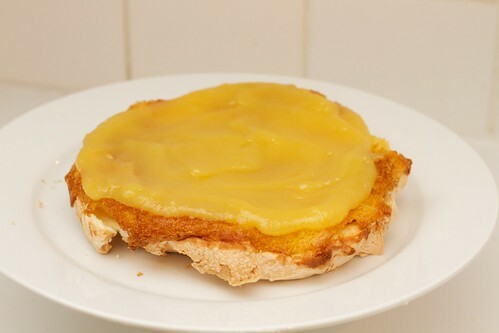 For anyone looking for pre-made lemon curd in a hurry, try the Yackandandah Jam version sold in the jam isle at Coles (and probably Woolworths), its pretty darn good. The recipe is available here and I followed it pretty closely, or as closely as my guestimating of weights will allow for. Preheat oven to 200 degrees and line & butter two cakes tins of preferably the same size. For some reason my two 21cm cake tins aren’t actually the same size, so when I’m making multi-layer cakes I just put the bigger cake on the bottom to make sure it doesn’t collapse in on itself. Combine the egg yolks with 100g sugar, the butter, flour, cornflour, baking powder, bicarb soda and lemon zest in a food processor. Add the juice and milk and process again. 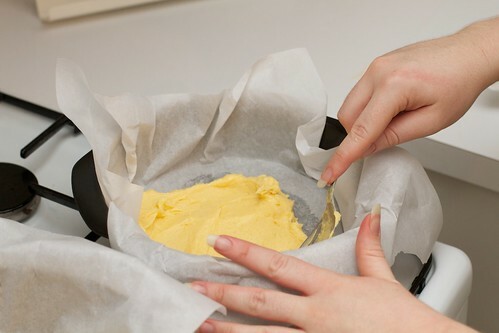 Fill each cake tin with half the mixture. In her recipe Nigella says that you’ll think you don’t have enough mixture to even cover the bottom of the tins. She’s right about that, I actually barely managed to cover the bottom of both, spreading out the mix with a spoon. Maybe that’s more because of my weirdly sized tins than the recipe though. Beat the egg whites and cream of tartar together until peaky, add in the sugar a bit at a time and continue to beat to make the meringue. 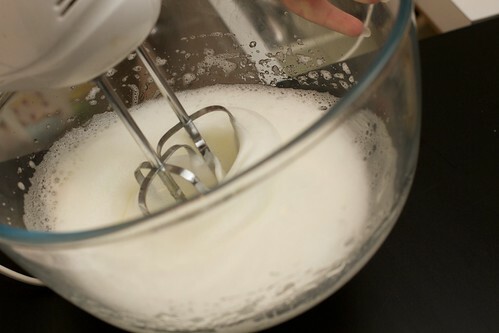 As with all meringue make sure to add the sugar in slowly and make sure it’s all mixed in before you add more so you don’t end up with a grainy texture. Spread half the meringue on top of the cake mix in each tin. 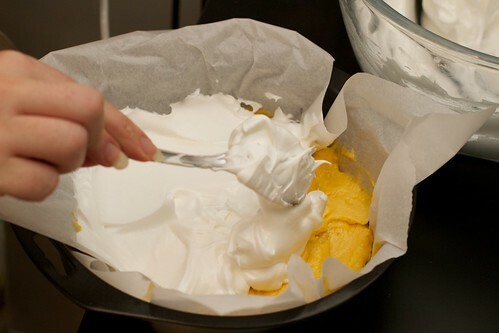 Smooth the meringue in one tin for a flat surface, form peaks on the other one using a spoon. Bake for 20-25 minutes until the cake is baked through and the meringue looks right (a little brown). 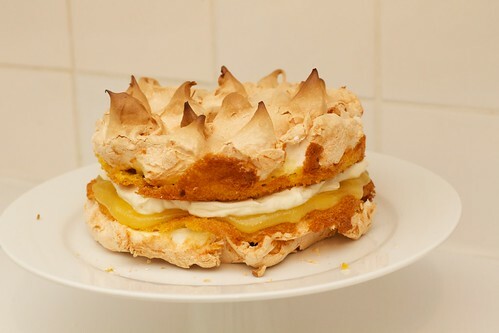 When the cakes have cooled completely, assemble by turning the flat topped cake upside down, cover the cake layer with lemon curd, cover the lemon curd with whipped cream and then top with the second cake. This entry was posted in Eating in. Bookmark the permalink. Trackbacks are closed, but you can post a comment.